XJ 300 Articulated power in micro form factorThe Xj300 is a new super efficient and ultra compact monoblock subwoofer amplifier. It is particularly suited to power demanding subwoofers and tactile shaker units. XJ300 distinguishes itself from traditional power amplifier by the unique class J amplifier with interface velocity controlled output and Look-Ahead technology. This technology enables high power and continuous operation in demanding 2 ohms impedances. 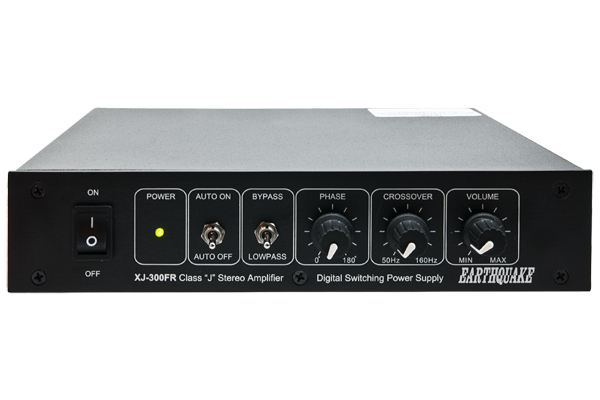 With its micro form factor and flexible adjustment options XJ300 can be adapted to almost any bass amplification job. Xj300's brute force springs from the class J amplifier. The patented Class J technology manifests a quantum leap in amplifier technology. The revolutionary aspect of Class J is its ability to combine a high efficiency of 99% with extraordinary bass control. Class J is an evolution on PWM technology that combines advanced multi-level feedback with an intelligent controller. It modulates the supply voltage and output switching frequency in real time based on the frequency and amplitude content of the input signal. This added level of intelligence to the amplifier offers several obvious advantages such as increased thermal headroom through the amplifier's optimum energy use, dramatically improved bass response and dynamic power capabilities. This results in a harder audible impact that adds a drive to the sound normally experienced only at live concerts. XJ300 is equipped with variable electronic crossover which is infinitely adjustable from 40Hz to 175 Hz. The optimal setting depends on the connected subwoofer or tactile device. Xj300 also has a continuously variable phase adjustment function, where phase can be changed between 0 and 180 degrees. XJ300 is very flexible and can be connected to both line level RCA signals from a receiver or preamplifier, and through high level speaker connections. This means that the same signal as for the loudspeakers can be connected XJ300s high level inputs. XJ300 has a signal sensing circuit that will turn on automatically when it receives signal.